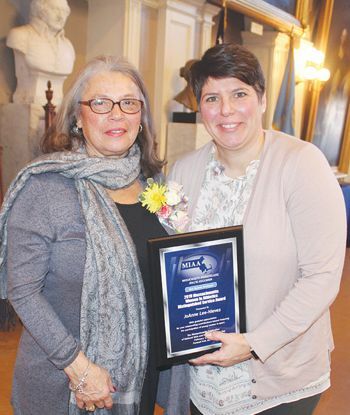 Johanna DiCarlo (right) presents the Massachusetts Women in Athletics Distinguished Service Award to JoAnne Lee-Nieves at the 2019 Girls and Women in Sports Day program Feb. 1 at Faneuil Hall, Boston. When the Title IX law was first enacted, leading to increased athletic opportunities for females in the mid-to-late 1970s and setting the foundation for the explosion of high school girls’ sports that exists today, there was a Chelsea woman just getting started in coaching. She was a pioneer in every sense, introducing the joy of organized sports participation to Boston girls, teaching them about teamwork and sportsmanship, instilling self-confidence in her student-athletes, and providing lessons about life that they would carry beyond the basketball court. JoAnne Lee-Nieves was a woman ahead of her time, recognizing right away the importance of athletics for girls as an extension of the classroom. Her players at Jeremiah Burke would achieve phenomenal success on the court. Long before ESPN started bringing attention to women’s sports, Lee-Nieves was building a program and sending her athletes on to college. For four decades, Lee-Nieves earned multiple championship and coach-of-the-year awards. No one did it better in Boston than Lee-Nieves. Last Friday, in an impressive ceremony at historic Faneuil Hall in the city where Lee-Nieves became a high school coaching giant, she received one of the MIAA’s most prestigious awards. Before a capacity crowd of female high school athletes, athletic directors and many of her former colleagues in the profession, Lee-Nieves accepted the Massachusetts Women in Athletics Distinguished Service Award. One could only imagine how very proud her parents, the late Charles Lee and Jeanette Weiner Lee, would have been to see JoAnne’s amazing career recognized so deservedly in such an awesome setting as Fanueil Hall. Councillor-at-Large Leo Robinson understands the magnitude of his cousin JoAnne’s statewide award and the immense contributions that she made to high school sports. His own daughter, Lucia Robinson-Griggs, is a former high school athlete and now a women’s basketball coach at MIT. In her acceptance speech, Lee-Nieves was humble and gracious. She thanked the MIAA for the recognition, but focused her remarks on encouraging the young ladies in the audience to work hard and pursue their dreams. As she left the stage and walked to the VIP area where she and husband Juan Nieves were seated, you could sense that JoAnne Lee-Nieves was touched by this lifetime-achievement recognition from the state’s official governing organization for high school sports. It was indeed a special day for a special teacher, coach, and role model. Johanna DiCarlo (right) presents the Massachusetts Women in Athletics Distinguished Service Award to JoAnne Lee-Nieves at the 2019 Girls and Women in Sports Day program Feb. 1 at Faneuil Hall, Boston. JoAnne Lee-Nieves and her husband, Juan Nieves, are pictured following the presentation of the Distinguished Service Award. On November 12th, the Club will be open from 9am-4pm (no school day due to Veteran’s Day); on Nov. 13th, the Club will be opening at 12noon, as it is a half day of school for CPS. On Wednesday, Nov. 21st, the Club is open 9am-4pm (no school day- day before Thanksgiving). And the Club will be closed on Thanksgiving, Nov. 22nd, as well as Friday, Nov. 23rd. And for those planning ahead, we want to remind Club members and families that we close during the winter holiday break, closed Dec. 24th- Jan 1st. The Club will re-open on Wednesday, Jan. 2nd. Special Events: This Friday, Oct. 26th is Haunted House! Tickets are available now until 6pm on Oct. 26th. If you purchase tickets in advance, please be sure to arrive by 6pm that night, as doors close at 6pm with or without tickets. In order to attend the Haunted House, you have to be a Club member and attend with an adult. Thanks to those who joined us this past week at the annual Breast Cancer Awareness event, Popping in Pink Party! Lots of pink-filled games and activities, with music, food, and a celebration of survivors and families members who have experienced breast cancer. And earlier this month, we also celebrated Hispanic Heritage Month with the Club’s annual Celebrando Latino, sharing our stories of our families, flags for our countries, and lots of the food, games, and music of so many different cultures. Thank you Chili’s for once again provided chips and salsa for everyone! 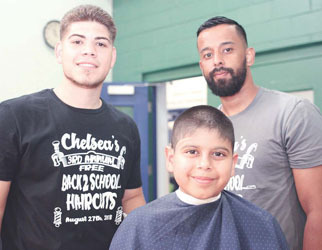 The 3rd annual Chelsea Free Back-to-School Haircut day took place at the Jordan Boys & Girls Club on Monday, Aug. 27. Six area barbers cut the hair of boys and girls in preparation for the first day of school Aug. 29. Here, event founder Luis Rodriguez and Councillor Yamir Rodriguez with William Arvarbo, who has a fresh trim. Kyle Umemba has modeled on runways around the world, but his real work as a [role] model is here in Chelsea. Umemba is one half of the co-founding team with Cesar Castro of the Let It Fly Basketball Tournament that will be held on Saturday, Aug. 11 at the Jordan Boys and Girls Boys Club on Willow Street. The fourth annual basketball extravaganza brings to Chelsea some of the best talent in the area. Umemba, 25, was once one of those aspiring players who carved out an impressive basketball career at prestigious Buckingham Browne and Nichols in Cambridge. A product of the Chelsea Youth Basketball League (CYBL) and an AAU standout, the 6-foot-3-inch guard/forward caught the attention of college coaches. He thought of walking on at Division 1 George Washington but chose to focus on academics. He graduated with a degree in finance and currently works as a consultant for Price Waterhouse Coopers – in addition to his celebrity appearances as a fashion model in New York, London and Milan for major designers. “It’s a good balance,” said Kyle. This month, Kyle is busy working with Cesar on the finishing touches for what has become the most anticipated summer youth tournament in the area. What was the inspiration for Let It Fly? And Umemba and Castro have done that in a big way, presenting $500 scholarships to 11 graduates of Chelsea High School and the Phoenix Charter School. The unsung hero of the Let It Fly Basketball Tournament is none other than Joan Cromwell, Kyle’s mother and the president of the Chelsea Black Community (CBC). “Without CBC and Joan Cromwell, this tournament would not be possible,” credited Castro. Kyle Umemba was asked whether he considers himself a role model for Chelsea kids. “I don’t really look for that – if my actions determine that, so be it, but I’d rather just have some type of positive effect on people,” said Umemba. Cesar Castro could dribble, drive, shoot, and pass – but what he did best in his four years on the basketball court for Chelsea High School was: score. Twelve-hundred-and-fifty-two-points worth, which makes him the second-leading scorer for boys in school history behind the legendary Craig Walker. He was the Commonwealth Athletic Conference MVP and led Chelsea to the conference title in his senior year (2010). The 6-foot-guard is still very much active in the game. He is an assistant coach on Judah Jackson’s staff at Chelsea High School. Interestingly, the Red Devils won the CAC championship this season. “It feels good to win a championship as a coach and a player,” said Castro, who went on to become an All-Region player at Bunker Hill Community College. He is a paraprofessional aide at the Wright Middle School in Chelsea and is close to receiving his bachelor’s degree from Salem State University. Because of daily interaction with Chelsea students in the schools and in the CHS basketball program, Castro, 27, saw the need for a summer tournament that could unite the community and bring some excitement to young players. And he’s not resting on the past success of the Let It Fly Tournament that filled the gym to capacity last year with a succession of exciting games. There are free refreshments, musical entertainment by DJ Max Max, and Raffles. Teams from Lynn, Boston, Cambridge, and Chelsea will compete in the older division. Some of the top prep school players in New England will be playing in the tournament. Castro said he and Umemba were members of the Jordan Boys and Girls Club in Chelsea while growing up in the city. Castro also thanked Chelsea Police officers Sammy Mojica, David Batchelor Jr., and Keith Sweeney, and Chelsea firefighter Jonathan Morilli for their assistance at the event, along with City Councillors Damali Vidot and Jamir Rodriguez, who have been big supporters of Let It Fly. The question of being a role model for Chelsea youths was posed to Castro. 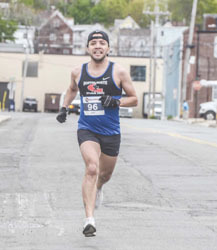 First place winner Fabian Mejia from Revere crossed the finish line on Saturday morning during the Chelsea Chase 5K to benefit the Jordan Boys & Girls Club. After six years of hosting diners from Chelsea and the surrounding areas, the Dockside location in the Mystic Mall announced this week that it would close as of this Saturday, April 7. Jack Urbaczewski and his daughter, Lisa Urbaczewski McKenna, made the announcement on Wednesday. Jack had operated a restaurant in the old Mystic Mall many years ago, and he also served on the Chelsea Police Department for 20 years. When he created Dockside Restaurants in Malden and Wakefield, then City Manager Jay Ash recruited Jack to be part of the new Mystic Mall shortly after the new Market Basket opened. The business will not become vacant, though, as Lisa said they have sold it to a Mexican restaurant from Malden that they are familiar with. The El Potro Mexican Grille will open in the spot soon after Dockside leaves. Lisa said they will continue to support efforts in Chelsea like the Boys & Girls Club road race, and the Salvation Army on Chestnut Street. A farewell get-together for the Dockside location is planned for Saturday, April 7, from 1-3 p.m. 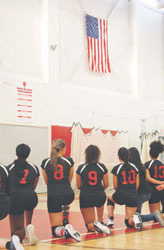 The Chelsea High Volleyball team takes a knee during the National Anthem on Tuesday afternoon, Oct. 3, in a game at home against Notre Dame, who chose to stand and salute the flag. The girls, including (L-R) Arianna Pryor, Xiana Herasme, Masireh Ceesay and Guidairys Castro, plan to continue taking the knee all season to highlight inequities the lives of minority youth and immigrants. One school in Methuen has asked that they do not come and take a knee at their venue, choosing to forfeit the game instead. The Chelsea High School girls’ volleyball team – a team loaded with seven seniors – has been together for several years and so it is that they’ve developed a family-like bond and a chemistry that sometimes helps them to act in unison. It’s almost telepathic, they say. In fact, when they first decided to take a knee during the National Anthem to make a statement on Tuesday, Sept. 19, at Whittier Tech, it was something they didn’t rehearse or plan in advance. It just happened, and now it has happened two other times and – like other National Anthem protests – is sparking a robust conversation in Chelsea High, outside in Chelsea and even into the other cities and towns where they play. All 11 players on the team are now taking the knee and did so as recently as this past Tuesday afternoon at Chelsea High. Ruchellie Jimenez said she also takes the knee because she has seen how others are treated, how people treat her. She wants that to change, and this was one way to draw attention to her cause. She added, as an example, that she recently wanted to improve her SAT score and went to a counselor outside Chelsea for help. Pryor said others have been taking a knee to make a difference, and she saw that and brought it up to the rest of her team. They had talked about it, but made no plans. As time went on, she said she wanted to be one to make things known, to let people know that things are not right. All agreed that they don’t mean disrespect to any soldiers, and are grateful for the service of veterans – those who have died and who have returned injured. They said, however, they picked the National Anthem because it was a non-violent and because it was one of the few outlets they had as high school athletes. She added that if they had made their protest at City Hall or another public venue, it could have taken a violent course – which they didn’t want. At school, it’s been a mixed reaction. A lot of students don’t agree with it, they said, while others are wholeheartedly behind them. Already, last Friday, the Chelsea High cheerleaders took a knee before the home football game. Coach Serena Wadsworth said when it became obvious how her girls felt about taking the knee, and that they planned to do so the rest of the year, she sent out a letter to other schools. Most, she said, understood, but one school in Methuen preferred that the girls not come to their school and take a knee. The school indicated it didn’t feel it respected its school values. They were willing to forfeit the game, and also were willing to play at Chelsea. Interestingly, the girls said their message isn’t really for those in Chelsea as much as it is for the other schools they play, many of which aren’t as diverse or understand the life that they lead. When the 2017 Chelsea High volleyball team is remembered, all of them agreed that it will probably be for their stand. They hope that it helps people think about what they did, and perhaps is something that’s continued. 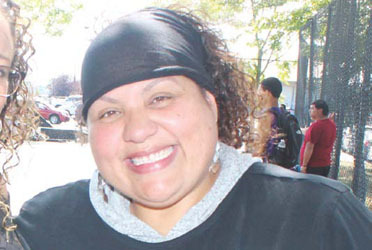 That’s one of the reasons that the 39-year-old Vidot, along with City Councillor Yamir Rodriguez, Danny Mojica, and Isidra Quinones, founded The Movement, a summertime youth basketball league. The league held its playoffs and season-ending pizza party Saturday at Highland Park. “The Movement was born out of some shootings that were happening in the community and we wanted to provide an outlet for kids 13-20 because I feel that’s an age that really doesn’t have enough supportive services that we wanted to engage them in during the summer,” said Vidot. The Movement has grown to close to 100 youths who participate in the outdoor basketball league Wednesdays and Saturdays at Highland Park across from the Jordan Boys and Girls Club. The mood was festive as the basketball players were united in spirit and celebrating the league’s second successful season. Police officers Keith Sweeney and David Batchelor Jr. were on hand to coach a team and affirm the support of Chelsea’s finest. Vidot understands The Movement is only in touch with its players a few hours a week on the basketball court and that the players must take responsibility for their actions beyond the court. “Even though we’re with them a limited number of hours during the week, I’m hoping it sets the tone for the rest of the week and they remember that there are grown-ups out there that actually care,” said Vidot. Betsy Vicente, mother of 14-year-old, 6-foot-2-inch aspiring basketball player Christian Rios, said her son likes the competition and atmosphere of The Movement. The extensive improvements to Highland Park’s basketball courts and playground are now being expanded to include lighting improvements and a rehabilitation of the parking lot – at an extra cost of $230,000. City Manager Tom Ambrosino broke the news to the City Council on Monday night, June 5, and told the Council that the scope of work needed to be expanded. While the original work included just refurbishing the basketball courts, playground and sitting areas at Highland, once the City’s Planning Department began designing the improvements, they realized there was a desperate need to make additional improvements. The lighting fixtures were outdated and the irrigation system was not working. The added improvements include paving the lot, replacement of the perimeter irrigation system, landscaping, an putting in modern lighting to illuminate the area more effectively. He also suggested installing new lighting on the Willow Street side of the park to help illuminate that busy area as well by the Jordan Boys & Girls Club and the Al Huda Society Mosque. In the original scope, the City received a state grant for $400,000 and contributed $170,000 to the project through the City Capital Improvement Plan. He called for the Council to tap into the $34 million Free Cash fund. The full expenditure will now be $800,000. The Council filed the request and will take it up for a second reading at Monday’s meeting.